Levitating decor items like plant holders and Bluetooth speakers are the thing to have right now — but there’s one other floating gadget on the market that really shines (if you catch our drift). What do you get when you combine the words fly, light, and the Swedish word for float? Um, only the coolest decoration of all time. Meet Flyte: the gravity defying, levitating light bulb that will leave you and your guests mesmerized. Thomas Edison would be shook right now. 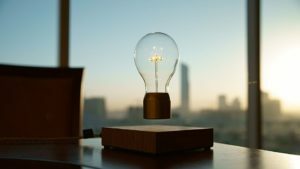 Flyte takes the common light bulb and merges it with magnetic levitation, allowing it to hover and rotate above its platform for hours. Feel the electromagnets lock it into place, take your hands away, and voilà: gravity defying light. Unlike the common light bulb, Flyte doesn’t need a switch, wires, or even batteries. It’s powered through the air by induction: a green alternative to the average energy-sucking bulb. Thanks to Nikola Tesla, we can use the electromagnetic field and mercury particles to create a fluorescent, UV light (and forget the electrodes that cause lightbulbs to burn out quickly.) Along with induction, Flyte uses energy efficient LED lights that can last up to 50,000 hours. That’s 12 hours a day for 11 years. Insert jaw drop.